Not a typo. The dish is a bit like a risotto but tastes a bit more substantial – tasty though and only uses one pot. Hooray. Haha! A total weight of 13lb – or, for those who might be a bit touched in the head, we’ve managed to lose exactly what we put on (Paul losing .5lb more than what he put on and me losing .5lb less)! Brilliant, not least because I can’t be bothered to change the ‘total’ image on the right of the blog. Hey I tell you what though – and this is in no way a disparaging comment against other classes I’ve visited, but what a difference a consultant makes. We’ve worked our way back to our very first consultant and she’s a genuine laugh – we were in that church hall digging those bloody awful church chairs out of our back-fat for a good two hours but it flew by. Reason? It wasn’t just ‘weight loss – well done – weight loss – well done – weight loss – well done’ which holds no allure for us. It felt like a proper class! If you get the right class, you stay, and if you stay, you learn. SIMPLE AS. Now listen, weigh-in nights are normally a chance for us not to post a recipe but instead spend the evening ped-egging each others feet and tormenting the cat. Well, we’ve been doing that, see? But lo, in the spirit of giving, here’s a recipe! Gosh! Firstly, the recipe uses sundried tomatoes normally, and feel free to substitute them for the moonblush tomatoes I’ve used in the recipe (sundried tomatoes are around 2 syns for 25g), but moonblush tomatoes are very easy to make and syn free. Perhaps half a syn at most per serving, anyway. I nicked the idea from Nigella Lawson and what that woman doesn’t know about cooking you could write on the side of a rolled-up twenty quid note. To make moonblush tomatoes, first whack your oven up to its highest possible temperature. You want it glowing like an Englishman’s shoulders in Benidorm. Next, cut a load of cherry tomatoes in half and chuck them in a bowl. Add a tiny drop or two of olive oil, a good glug of balsamic vinegar, salt, dried oregano, bit of thyme, pepper. Mix gently so the tomatoes are covered but try not to squash the tomatoes. Next, tip them onto a baking tray with the cut side facing up – pack them in tightly. Once the oven is at the highest temperature and you could light a fag off the vapours, turn it off, open the door, quickly throw the tray in and leave it overnight. The hot air will dry your tomatoes out – not completely, but that’s fine – you want them a bit squishy. Syn-free and full of taste! Make it even more interesting by using a range of tomatoes of all shapes and colours. If you DO insist on using sundried tomatoes in oil like a filthy slattern, hoy them in a sieve and pour boiling water on them – gets rid of the oil, see. 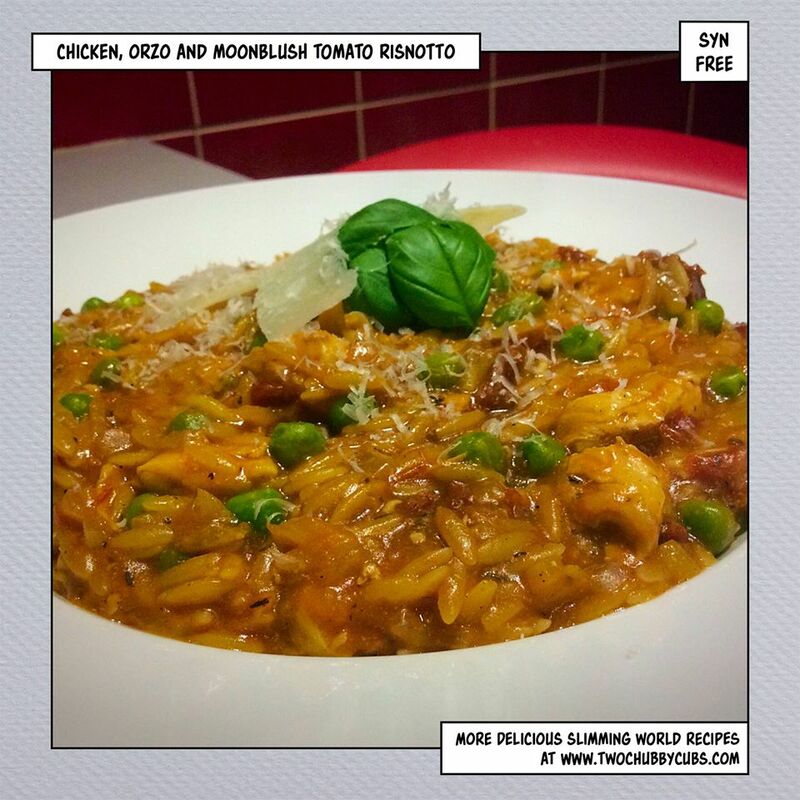 two chicken breasts cut into chunks, 200g tomatoes, tiny drop of oil, 1 large onion sliced finely, three garlic gloves, 400g of orzo pasta (or rice), 3 dollops of tomato puree, 900ml of chicken stock, 1/2tsp of oregano, 1/4tsp of thyme, 1/4tsp of lemon zest and 1/2tsp of balsamic vinegar. Basil leaves, black pepper and parmesan to serve. now cook gently, on a medium heat, adding stock one ladle at a time and stirring – don’t leave it to stick, and eventually, it’ll go nice and gloopy and thick – tasty! serve in a big bowl with a smashing cheesy grin on your face. Just a note – buying a whole lemon just for the zest is a bit silly. So use whatever you need to, then pop the lemon in the freezer – you can use it next time you need zest! Failing that, cut it in half, put it in a tiny bowl of water and microwave for thirty seconds or so, then use it like a sponge to clean your microwave. Gosh we really ARE the gift that keeps on giving tonight. Please tell me that lemon trick is one you are sending in to pick me up/take a break or similar and not one you’ve learnt!? Oooh imagine, we’d never get owt done for laughing! 😀 thanks Ruthie, your kind words are noted! Quick question, when making the lovely sounding tomatoes do you leave the oven door open? I am currently in the process of making your baked bean lasagne, I dug from the bottom of the freezer what I thought was some mince, it turned out to be left over West African beef curry, slimming world recipe of course 🙂 I am wondering what effects this may have to the wind !! Hello! Just checking this on the netty at work so good timing! You’ll want to keep the oven door shut – you want it as hot as possible for as long as possible, and then the oven turned off, tomatoes in and left to bake! Good heavens, baked beans and curried mince?! I hope you don’t smoke! No no! You’re right, and we add peas to all sorts of stuff – so you were right to ask 🙂 welcome and thank you! I am guessing where the methods says to add the rice, that this is the Orzo? That’s right 🙂 and cheers! when you have made these can you freeze them? No idea I’m afraid! If you try it though and it works, could you let us know? Cheers! when you have made the moonblush tomatoes can you freeze them? Thank you for your recipes, you’ve made it possible for me to carry on with slimming world and stay with my boyfriend, he bloody hates slimming world recipes! Great recipe! Thank you guys, you have made the first steps back into SW a lot easier and I look forward to trying as many recipes as possible.. The witty repertoire helps too! Did you guys do an instant pot version of this? No, but it would definitely work in an instant pot! I did it in the One Pot yesterday, put it on the pasta setting (didn’t want the pasta to go squishy) and it all cooked a treat. Thanks for letting me know will give it a try. The 200g of tomatoes – is that raw or ‘blushed’ weight?